Position: How Tos - Data Recovery - How to recover my deleted photos? How to recover my deleted photos? Is it possible to retrieve deleted photos? This article will show you how to recover my deleted or lost photos, images and pictures from PC, memory card, USB disk or iPhone in Windows 10/8/7 via simple methods. There is no need to be panic when accidentally deleting photos, you can follow guides below to get back deleted photos, video, music and other files easily and completely. 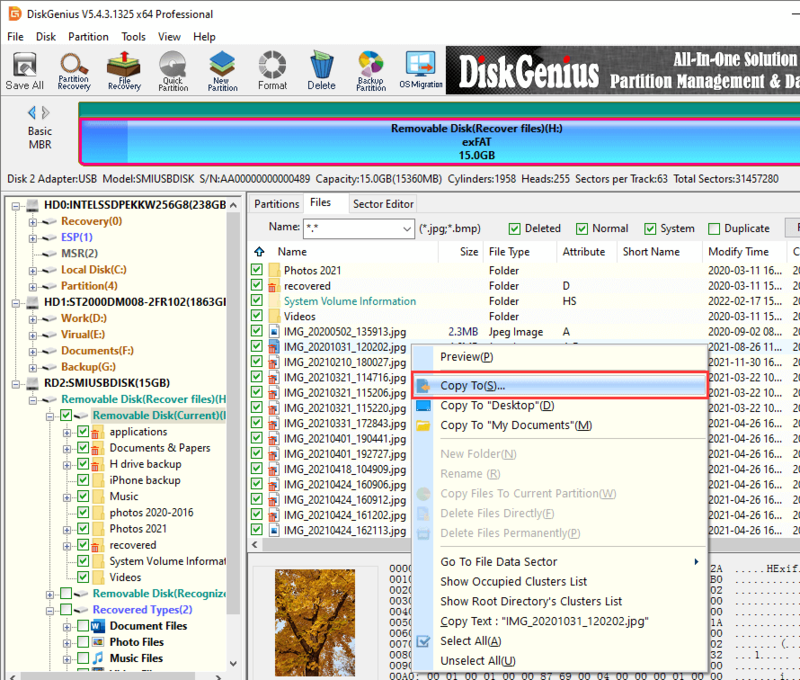 DiskGenius - Reliable recovery software to get back deleted photos from internal and external drives. Is it possible to recover deleted photos? Guide 1: How to recover my deleted photos without software? Guide 2: How to recover my deleted photos from SD card & PC? Guide 3: How to recover my deleted photos from iPhones? "Hi, everyone. I just got to know many photos were deleted accidentally from the DCIM folder (the camera folder on memory card). This memory card is 32GB and it has been used on the digital camera for 3 years. I am not sure the exact cause why photos got lost and deletion might be most possible reason, as I viewed photos with my family yesterday. I wanted to transfer those photos to laptop for backup this morning, but when I connected the memory card to computer, the photo folder is almost empty. Files are not hidden, as the property shows correct free space. So I'm guessing photos got deleted. Is there any efficient solution to restore my deleted photos from Windows 10? These pictures are of great value to my family. Thanks"
Have you ever accidentally deleted photos and there is no backup available? Have you thought about the possibility of losing important photo one day? There might be various scenarios that photos get deleted and the most common ones are human error, accidental deletion and virus attack. When it comes to accidental deletion, most of us should be quite familiar. For example, the device user may delete photos which are stored on smartphones or camera by pressing the wrong button. Though most devices ask confirmation for deletion of files, there are still instances that people just mistakenly confirms the action. One more possible scenario of deleting photos happens when your kids use the device. Kids use smartphone to play games or watch videos and they may delete data without awareness. Besides, virus or malware infection is another common cause. Virus can cause a series of issues, including data loss. When an SD card is inserted to a computer so that user can transfer photos to computer. If computer is infected with virus, and the SD card is exposed to virus and it tends to infect virus as well. Deletion of photos is a real threat to data security, and it is highly recommended to back up photos on a regular basis. Backup is able to protect data against loss in most cases. If you do not keep any backup, you should know how to get back deleted photos when photo loss issue appears. In this page, I will show you how to recover my deleted photos from SD card, computer disk and iPhones with the help of deleted photo recovery software. Therefore, the chances of successful recovery of lost photos mainly depending on actions you carry out after data loss. You should try best to avoid any possible operations that may destroy lost data. Besides, the recovery result also counts on the effectiveness of photo recovery software. Photo recovery software is designed with special algorithms and it has a good understanding of how system sores data and how files are managed. Thus it has the ability to perform a deep scanning on the disk and find out recoverable data. Next, we'll explore some data recovery software to get back deleted pictures. 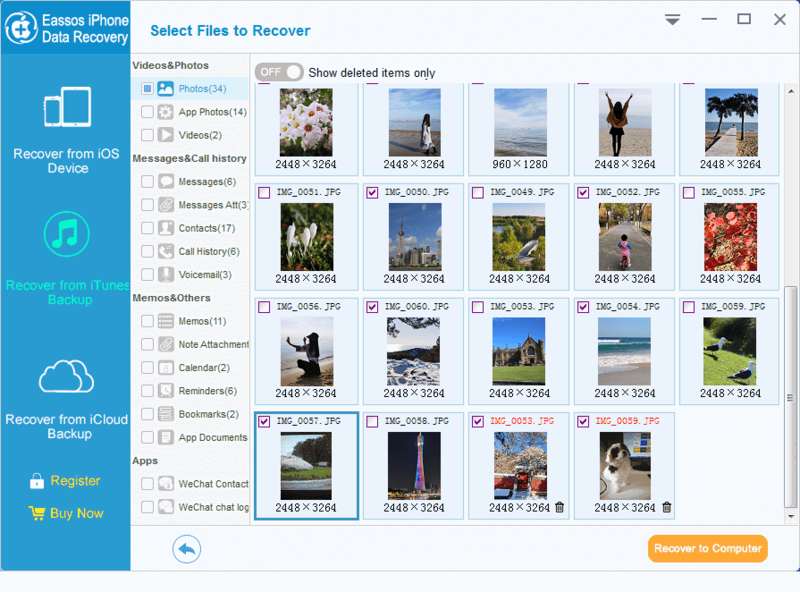 After photos get deleted, there are three ways you can try to retrieve deleted pictures: you can restore them from Recycle Bin, retrieve lost photos from backup and recover deleted pictures with recovery software. However, there is possibility that you've emptied Recycle Bin or deleted photos haven't been backed up. In this case, a photo recovery program is needed to recuse lost data. Actually, utilizing a piece of data recovery software is an effective solution to deal with data loss issue. Here we recommend DiskGenius and Eassos iPhone Data Recovery to restore lost pictures from PC, memory card and iOS devices. Free download photo deleted recovery software and you can start recovery now. Eassos iPhone Data Recovery: This iOS data recovery software provides 3 recovery modes which helps recover lost data from iOS device, iTunes backup and iCloud backup. Thus, you have multiple ways to get back lost data in different data loss situations. The recovery process is easy and simple, which does not require the user should be experienced in recovery. 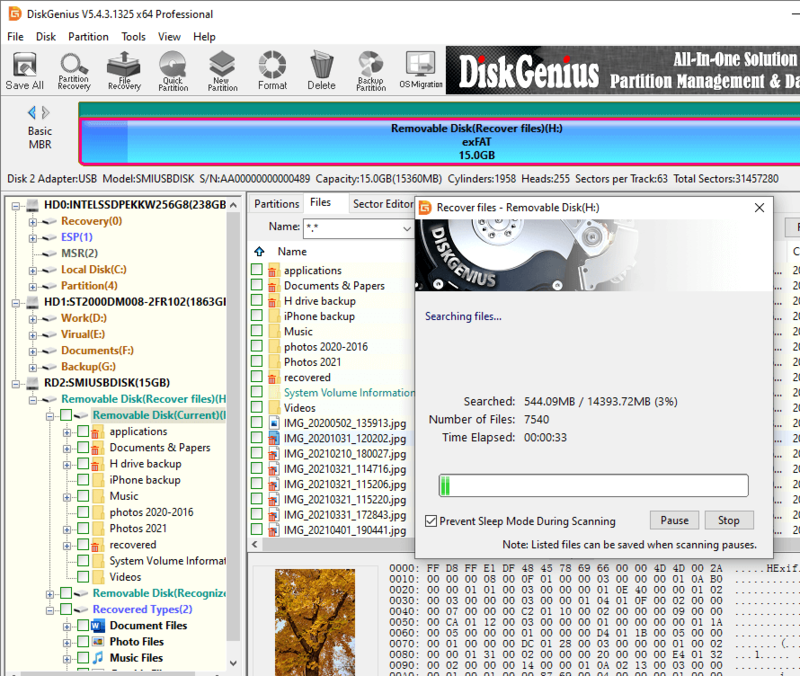 DiskGenius: With this tool you can easily complete photos recovery task with high success rate. It supports to recover lost photos from cameras, PCs, memory cards, internal/external hard disk, USB flash drive, virtual disk and more. It is capable of recovering different formats of photos, videos and videos and the supported photos formats includes but not limited to CR2 /CRW, RAF, K25 /KDC /DCR, MRW, MOS, MEF, NEF, NRW, ORF, SR2, ARW, SRF, BMP, GIF, PNG, PSD, INDD, etc. The deep canning process will search the device sector by sector and analyze the binary pieces, so that it can identify as many files as possible. In many cases, such recovery process enables you to rebuild files which were lost long ago. Once scanning completes, you can preview recoverable files and make selectively recovery. This method discusses how to recovery deleted photos without using any recovery software, but it does not apply to all data loss issue. If this does not work on your case, you need to try rest two recovery solutions. Step 1 Restore deleted photos and files from Recycle Bin. In general, files deleted from computer local disk are put into Recycle Bin where you can restore them easily. 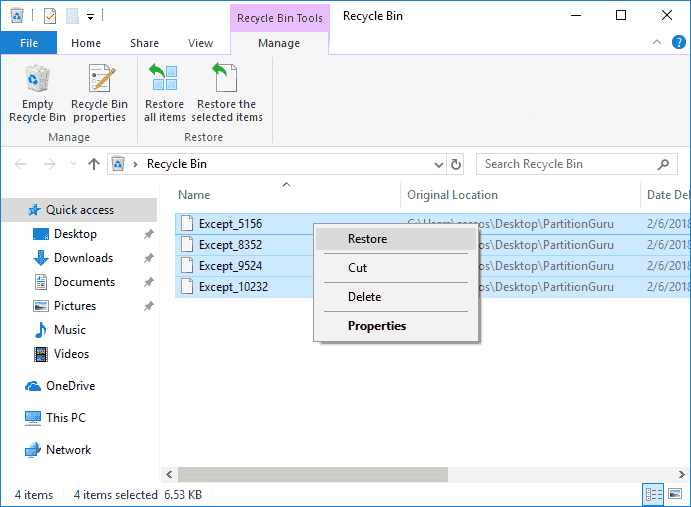 Open Recycle Bin and find files you want to recover, and right-click them to choose Restore. If there are too many files in Recycle Bin, you may take a while to find out desired data. Here are some tips that can help you quickly locate data. If you remember the file name of deleted photo, you can search file name via searching box; if you just remember the file type, such as PNG or JPG, then order data by file type; besides, you can order file by deleting date, original locate, name, size, etc. It is quite easy to restore deleted data from Recycle Bin, but it does not work on all deleted photo recovery issues. For example, you won't be able to find file in Recycle Bin if photos are deleted via Shift + Del or Recycle Bin gets emptied. Step 2 Recover deleted pictures from Previous Versions. Sometimes, the folder which contains deleted photos is not removed from computer and you can try whether deleted photos can be restored from the previous version. Right-click on the folder and choose Restore from previous version; then the previous version can be found on the pop-up window. In this part, you can learn how to recover data from SD card, PC, memory card, USB flash drive and other devices with the help of data recovery software. This guide can also be used to recover files lost due to formatting, partition corruption, RAW drive, etc. The entire recovery process is easy to follow and does not require any complicated computer skills. Step 1 Install and launch DiskGenius from your computer. Then select the drive to be recovered and click Tools -> Recover Lost Files, as below. Do not install the recovery software to the drive where lost photos were stored. 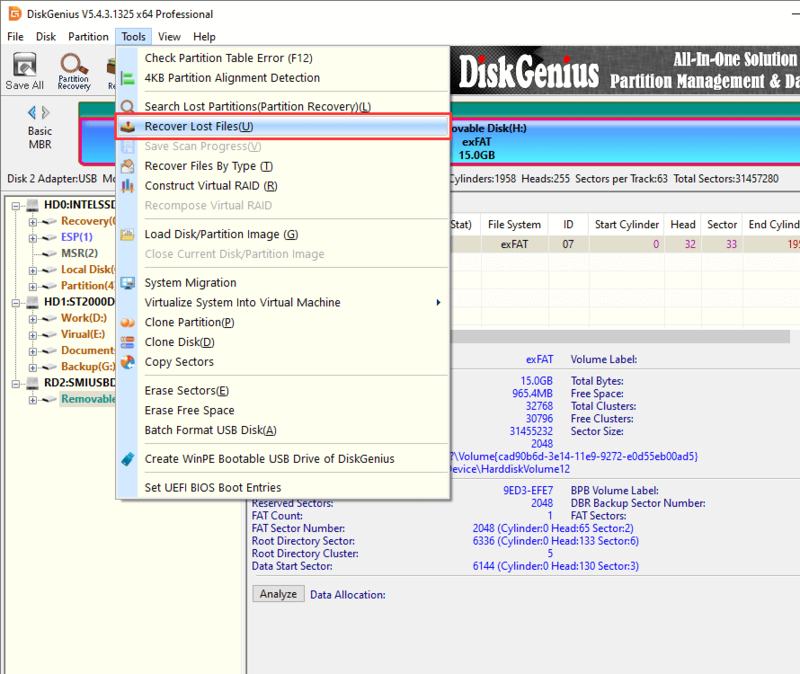 Once DiskGenius is launched, you can see an interface which displays disks and partition clearly and you can easily locate the drive in question. Step 2 Select recovery options and click Start button. 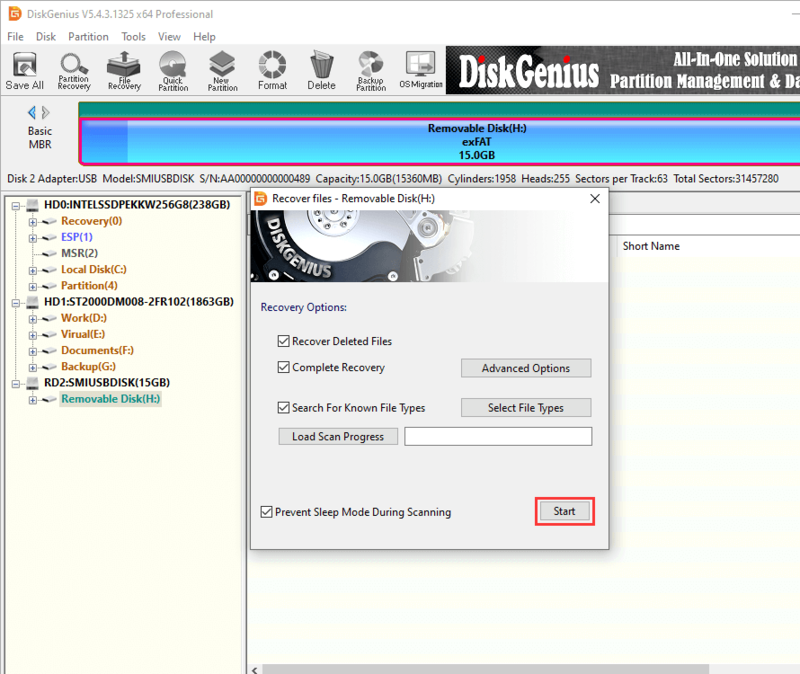 You can just follow default setting on the pop-up window and click Start button directly, after which DiskGenius starts to search for recoverable data from selected disk area. It is recommended to select Search For Known File Types if lost data gets partly overwritten or there might be fragments on the device being scanned. You can preview during or after scanning. Click a file and you can see a thumbnail preview on the lower part of the interface and double-click a file and you can view its original data from a pop-up window. Step 4 Recover lost photos. Choose photos you need to restore and right-click on them to select Copy To. Do not save recovered photos to the device which needs recovering data. Eassos iPhone Data Recovery software allows you to easily recover deleted or lost photos, contacts, messages, videos, notes and other data from iPhone, iPad and iPod touch. When your images get lost from iOS devices, you can try this tool to get back lost data. This recovery tool provides a trial edition which works the same as the registered edition when searching for lost data, thus you can easily evaluate it before purchase. Step 1 Install and run Eassos iPhone Data Recovery on your Windows computer. Then select recovery mode and click Start button. 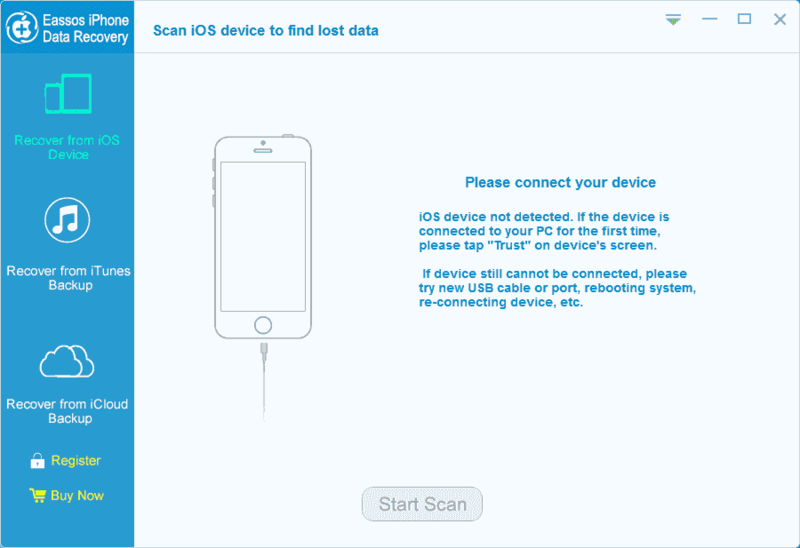 If you want to recover data from iOS device directly, you need to connect your iOS device to computer via USB cable so that it can be recognized by the software. Step 2 Preview recoverable files in scanning result. When the software finishes scanning, you can preview all listed files. File preview helps to check if the file is correct and quickly locate what you need. Select files you want to restore and click Recover to Computer button; then you can select or create folder on computer and save recovered data. That's all about recovering my deleted or lost photos, and you should be able to retrieve lost photos from all kinds of storage devices now. There are quite a lot of recovery options available and you should try the effective ones. Never ignore the importance of backing up photos in time. Always keep recovery software installed on computer in case of data loss issue. If you need any help regarding photo recovery and have better solution, please feel free to contact our tech support team. DiskGenius - Easily and completely recovers my deleted photos, videos, music with high success rate.